Actually, we have known for years that these 3 vice-presidents would be replaced at the end of 2018, as their contracts were running out at that date. Your interpretation is not quite correct: they are not changed because of the scandals, the system was designed so that the new 2018 president could chose new vice-presidents to support him and his policies, whatever these would be. 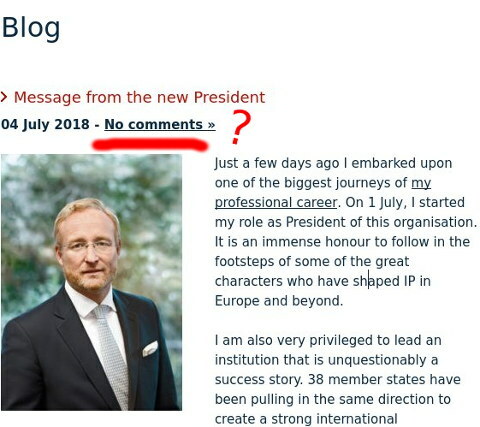 The real problem in the EPO is therefore a problem of governance: there is no administrative continuity and little transition between the old and the new presidents and the new president again gets absolute power over the organisation. In the original design of the EPC, the idea was that vice-presidents would be mandated by the administrative council and would counter-balance the powers of the president. That idea does not work when the president gets to choose them personally.